This is one of those products that you see and say to yourself...there is no way that thing is actually going to work. 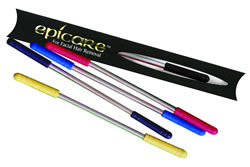 Epicare So Easy ($16.99) brilliantly takes the place of messy home waxing. It also gives you the chance to use it anywhere you go and makes hair removal quick and fuss free. The trick, is that the Epicare actually bends. It basically is tightly wound coils that grab onto your facial hairs and remove them from the root. Depending on your threshold for pain, you might feel a little bit of pain, to a good amount. On a scale of 1 to 10...ten being labor pains...I would say this comes in at a 1.5 for me. I would think that with constant use, it would get less and less painful. The Epicare definitely removed all of my hair with a few passings and it didn't leave me with red skin after it was done. Which is just about perfect in my book. Head on over to epicaresoeasy.com to purchase, or to find out more information.